Here's the final installment in my series on winter accessories to brighten up dull coats and dreary days. 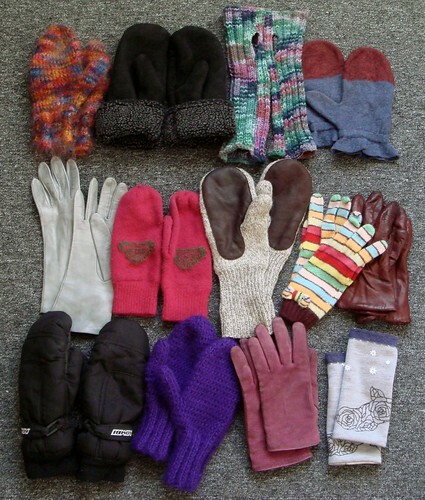 Click the photo to read about the mitts and gloves. So, yesterday, my sense of style finally curled up to hide away and hibernate for the rest of the winter. I showed up at the office in an extra large red hooded varsity sweatshirt which had, until then, been strictly reserved for wearing on camping trips. Once we hit -19C (windchill to -25 C), comfort and warmth is the only thing that matters to me. Look, try walking to work in those conditions and just see if you arrive looking fabulous!